Published Jul 25, 2014 by Adobe Press. Depending on the version of Photoshop you're using, your Channels panel may not match the screenshot in lesson 6 on page 151. A Photoshop update released after the book was published changes the way the mask is displayed in the Channels panel. Despite the change, you should be able to complete the lesson following the steps as written. The screenshot for step 3 on page 187 is incorrect. 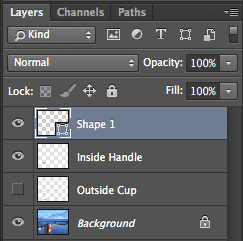 The layers panel should only show one shape layer, not two. The second shape layer appears only after you use the custom shape tool. Below is the correct screenshot for that step. The instructions for the "Mixing colors with a photograph" section on pages 232-234 are incorrect. Wherever those instructions mention "Very Wet, Heavy Mix," it should only say "Very Wet."